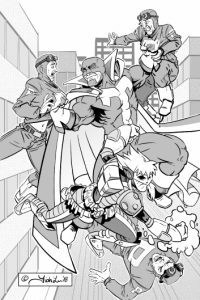 T-Man & HyperStrike is an upcoming Comic book from Mr Fish Comics! If you want to stay up to date with what’s going on, and when you can order your copy send us an email by clicking HERE and we will put you on the mailing list. Keep watching at Tourette’s Life for updates, videos and sneak peeks!